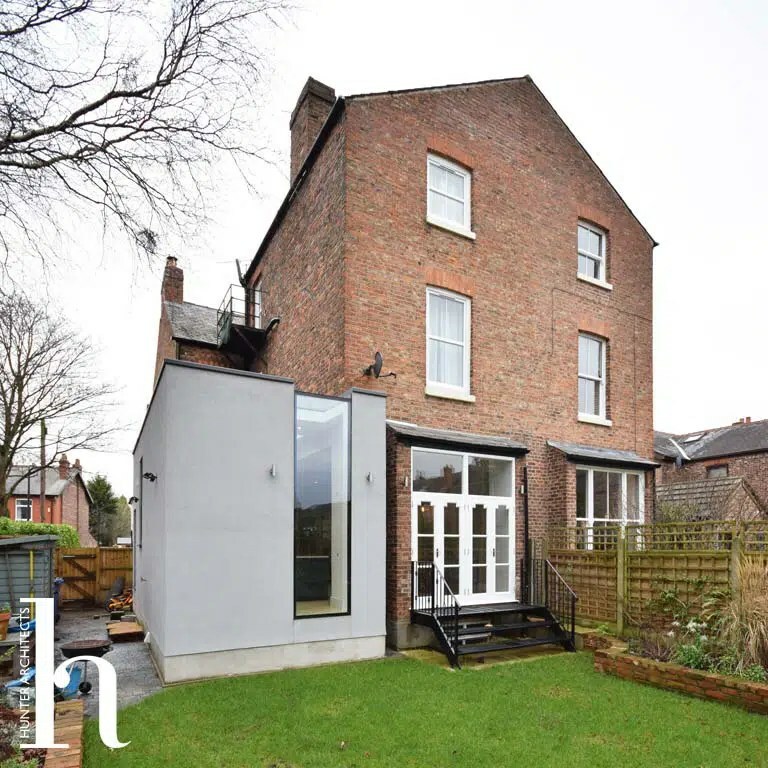 The existing house was a typical but substantial Victorian semi-detached house, requiring a full programme of renovation and updating, including creating a master bedroom suite, utilising the loft space as well as the substantial basements along with the kitchen extensions. The existing rooms and spaces of the house were of a good proportion, generally with high ceilings and most of the changes and improvements could be incorporated without affecting the external shell of the building. The existing kitchen, however, was located in the basement and had limited head height and natural light. The kitchen was a good size, however, had no real space for dining or living and was only accessed via a small staircase hidden away from the main house. Our clients had a young family, and it was felt the current kitchen configuration was less than ideal as it separated the main living spaces across two floors. The kitchen extensions brief, for this part of the house, developed to require an open plan family room, featuring living, dining and kitchen spaces with better links to the garden, better daylight and better integration into the house as a whole. The existing ground floor had three large rooms. The room to the front was left in its original configuration and became a multi-functional room that would change over time as the children grew. The two rear rooms we able to be utilised for the new family room although were not originally linked together. 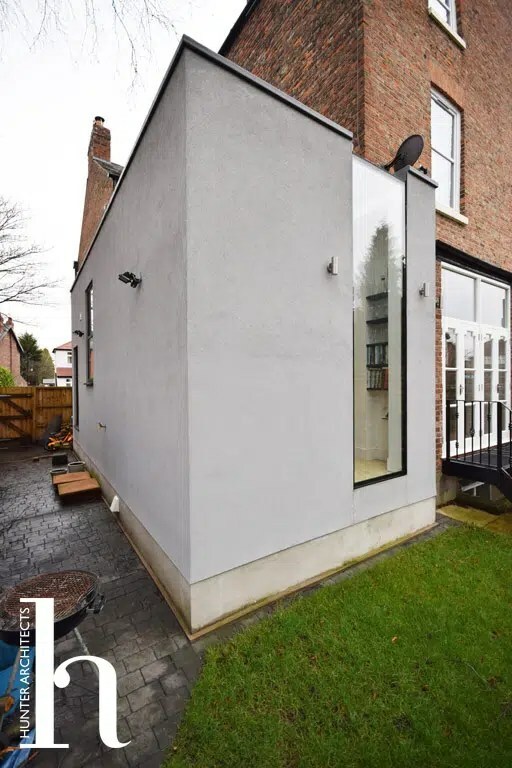 Kitchen extensions were proposed to enable these spaces to be joined together as well as utilising the under-used yard space to the side of the three storey out-rigger extension. The location of the kitchen extensions meant that the original middle room now had no natural light. However, this was resolved by adding two windows either side of the existing chimney breast, as illustrated in the photographs. 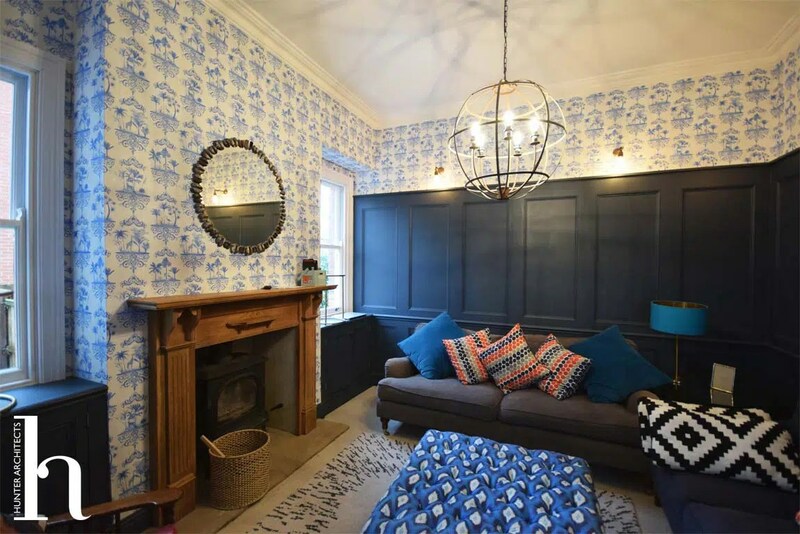 It was felt that retaining the existing proportions and features of the large rear room was important and as such, the existing cornices were retained. The existing rear window was amended into a set of full height doors, providing better access to the rear garden. 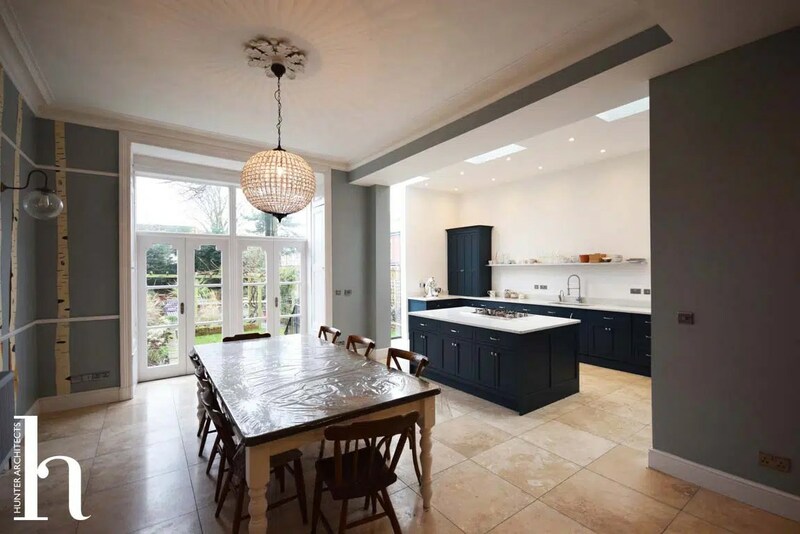 The kitchen extensions to the side of this main room needed to reflect the scale and proportions of the existing house, and it was felt that a contemporary kitchen extensions addition would help create a feature to the house. Neighbouring properties overlooked the side elevation, and as such, no windows were added to this elevation. Roof lights, to the flat roof, were added to bring natural daylight into the kitchen. The positioning of the kitchen island unit and the bulkhead above helped to separate the traditional existing living space from the contemporary kitchen spaces while allowing a free flow between the two. 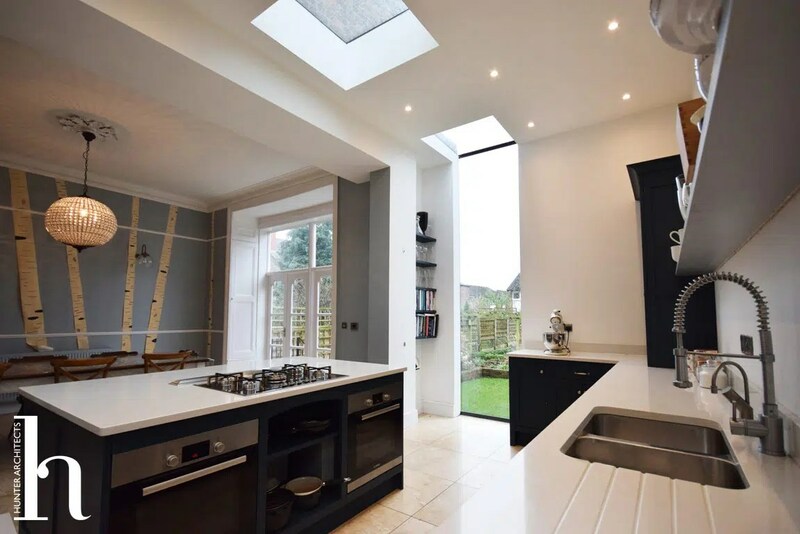 The long thin proportion of the kitchen extensions helped to orientate the focus between the kitchen and dining spaces and a full height contemporary window and roof light detail as added to provide a feature and view of the garden while cooking. 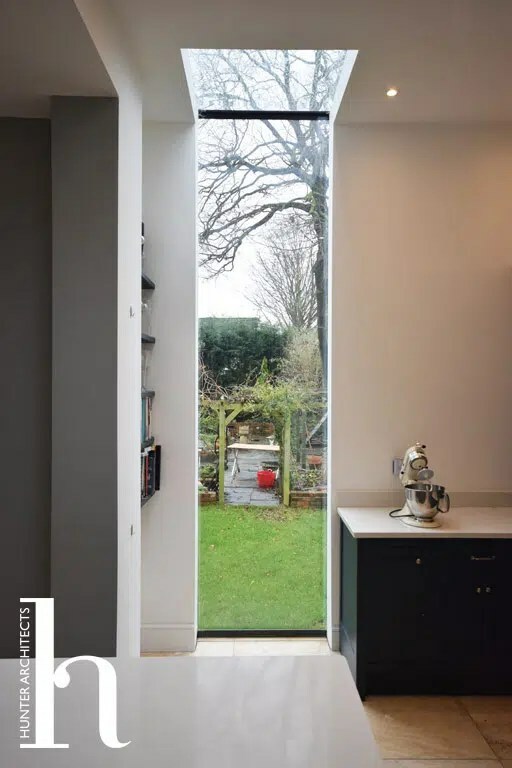 The slight rearwards projection of the kitchen extensions allowed for additional storage to be incorporated, which was hidden away from the main living spaces. A small utility and WC were added between the kitchen and living spaces. Our clients were keen for the living space to retain its own identity and function although be linked functionally and visually to the main kitchen and dining spaces. A large sliding partition allowed the room to be opened up when needed, but also closed off to provide privacy as well as acoustic separation from the main spaces and kitchen extensions. Features: Kitchen extensions; refurbishment of existing house, better links to garden, glazed roof. Contemporary design. Formal living room. Basement.